This interactive presentation contains the latest oil & gas production data from 97,332 horizontal wells in 10 US states, through September 2018. Cumulative oil and gas production from these wells reached 9.7 Gbo and 106 Tcf. West Virginia is deselected in most dashboards, as it has a greater reporting lag. September production data for New Mexico is rather incomplete, with over 100 thousand bo/d still missing. After all revisions are in, oil production from these horizontal wells should come in well above 6 million bo/d for September. The ~8,000 wells that started in the first 9 months of 2018 will then already have contributed ~3 million bo/d in September. Never before in the history of US shale was so much new production capacity added in 9 months. As the total decline of older wells (<2018) was over 2 million bo/d (as shown by the top of the light blue area) in this period, the actual growth rate was a little below 1 million bo/d. If you switch to natural gas (using the ‘Product’ selection), you’ll see that gas production from the same wells never really experienced a drop, and grew by ~15 Bcf/d in the past 2 years to 55 Bcf/d (excluding WV) in September. Initial well productivity grew steadily over the past 10 years (‘Well quality’ tab), but the rate of improvements appears to have slowed down recently. You’ll find the status of the more than 100,000 horizontal wells that have been drilled in the ‘Well status’ tab. Only 1% of these wells have been plugged and abandoned so far. The final dashboard gives an overview of the largest operators. EOG is well in the lead, with around 0.5 million bo/d of operated production capacity. Its September production numbers for New Mexico are highly incomplete, so the final drop should be ignored. This “Ultimate recovery” overview shows the relationship between production rates and cumulative production over time. The oil basins are preselected, and the wells are grouped by the year in which production started. The 4,300 wells that started production in 2011 (represented by the red curve) peaked at a rate of 273 bo/d, and they have now declined to 22 bo/d, recovering almost 150 thousand barrels of oil in the meantime (all average numbers). The 5,300 wells that started 5 years later (2016 – light brown curve), peaked at 517 bo/d, and they already recovered the same amount of oil within 22 months, on average. They are on a trajectory to do roughly another 100 thousand barrels of oil, before having declined to a similar production rate of ~20 bo/d. More granular and recent data will be visible after grouping these wells by the quarter or month in which they started production. Next month we will be at the NAPE summit in Houston. Come visit our booth if you have the chance! Before the NAPE we plan to start offering the Basic version of our ShaleProfile Analytics service. For just a very small annual fee ($624 = $52/month) you can already enjoy all the benefits that this service offers beyond the free blog here, such as maps with the exact location of these wells, full-screen dashboards, and with always access to the latest data. Early next week we will have a new post on North Dakota, which just released November production data. Here’s one I’m tired of thinking about. As you say production has increased 1 MMBOPD through September. This is after a 2 MMBOPD decline from the prior to 2018 wells. Agreed. Looking at your ultimate recovery plots on average, US has brought on 880 wells per month since september with a peak daily rate of around 650 BOPD. I get an average total uplift of 573,000 BOPD per month. Over 9 Months that is +5.15 MMBOPD. Is the difference between 5.15 MM peak rate calculated uplift and the 1 MMBOPD net in the numbers all due to 2018 well declines? Is the difference between the 5.15 MMBOPD uplift calculated and the 3 MMBOPD actual consolidated increase all in 2018 well declines? There is 2.15 MMBOPD of decline? Great to hear from you again, I’ve been missing your insights! Indeed around 880 hz wells were brought online in the states that we cover each month. However, that also includes the gas basins, which are deselected in the ultimate recovery plot. If you only look at the oily basins (Permian/Bakken/EF/Niobrara), then this number drops to 736 wells/month. These wells had indeed a peak performance of almost 650 bo/d, calculated based on calendar months. Therefore, if all the wells from Jan-Sep 2018 from these basins would have peaked in the same month, there would be an uplift of ~4.3 million bo/d. Thus, these wells indeed already declined ~1.3 million bo/d themselves over this 9 month period, before I counted them in the 3 million bo/d figure for September. There are only a couple of minor points I left out here. Been busy drilling wells and then we have another bust! It appears both you and the EIA agree, the legacy decline is close to 3.5 MMBOPD annualized. Wow! 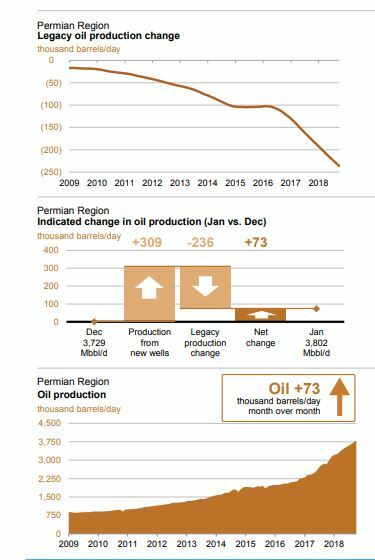 Look at the behavior of the Permian legacy decline below… it is 3 MMBOPD per year on a 3.75 MMBOPD production base and headed South! Howdy from S. Texas, Jim Brooker, where I too found myself busy drilling new wells to then find the rug pulled out from under us, again, with more leveraged oversupply. I can’t decide if I have big nuts or am just stupid to stay in the oil business in the face of this sort of price volatility. Rystad recently implied 70-80% of America’s shale oil wells currently being drilled simply offset legacy decline. Enno may have a better number, and hope he will say, but I find that astounding. And as I am a big opponent to debt, and production growth thru use of debt, I now do not now see an avenue for significant deleveraging of that debt, ever, short of $100 plus oil, sustained. This shale oil thing is a mess that does not seem to be getting better, in spite of increased productivity. With about 2.1 million bo/d needed to offset legacy decline, out of the 3.0 million bo/d that was added, I come up with ~70%, for the Jan-Sep 2018 period. This number is always changing over time. Good to hear from you. 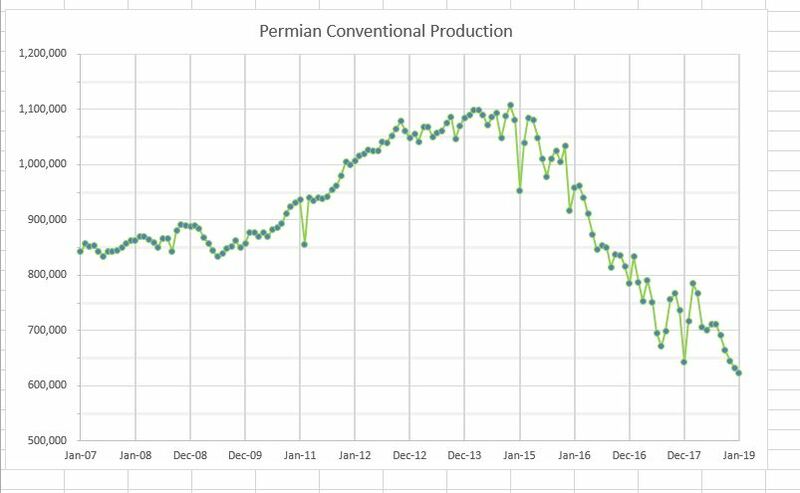 I just took the EIA Permian production numbers and subtracted Enno’s production from 2008 forward in attempt to derive a Permian Vertical or Conventional production plot. Below is what I get…. could this be real- Are they letting the old stuff go that much? Jim, that precipitous decline corresponds to some high 20, low 30 dollar oil in 2015; it is interesting nevertheless. If the HZ frenzy has been sufficient to HBP leases, there are still lots of hoops to jump through to shut conventional wells in with the TRRC. 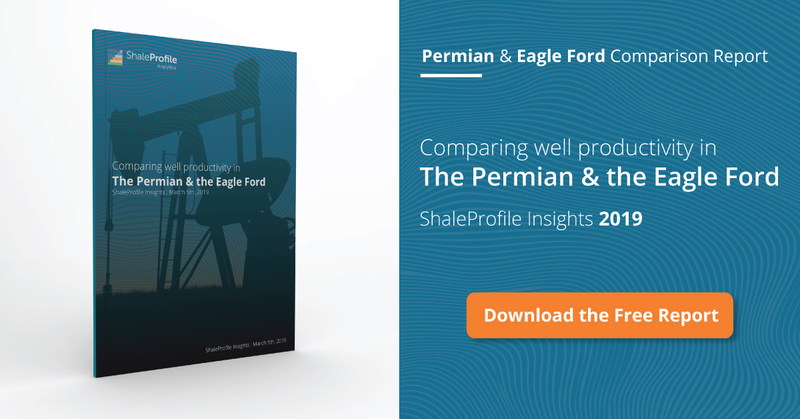 Operating costs in the Permian, like elsewhere in Texas, have gone sky high because of shale activity; rig availability is scarce and labor for lease maintenance, etc. is non-existent. Everyone wants to work for the shale oil industry because they can charge so much more, even though they typically only get paid on 120+ day terms. I know, first hand, that produced water is hard to dispose of in West Texas now and can cost upwards of $4-5 per bbl. So, it is plausible to me that incremental lift costs per BO are now so high for marginal stripper wells they have to be shut in. Perhaps too, low volume stripper well operators in the San Andres or Spraberry, for instance, can’t sell their oil because of takeaway constraints. Whatever the reason it is a great tragedy. America is now putting all of its oil eggs in the shale oil basket, particularly the Permian basket, and our hydrocarbon future is based almost entirely on the shale oil industry’s ability to borrow more money and/or defer existing, long term debt. If they shut-in the paid for vertical wells that could interfere with the new horizontal, would that be a lot of production? That’s a good point given the frac bashing of shallow, vertical wells going in the SCOOP/STACK; in 2010 PXD had 48K BOEPD of vertical Spraberry production in the Midland Basin, so its nothing to sneeze at.